If your bathroom remodeling project includes an overhaul of the stand-up shower, it's ideal to give careful consideration to the elements that you may wish to add to this fixture. One such element to consider is a bench. Adding a bench to the shower can blend style and function — the right look of bench can perfectly suit the style of the shower, giving the fixture a luxurious feel. Additionally, if you're the type of person who enjoys long, restful showers, a bench can be perfect to allow you to rest for a few minutes as the water flows over your body. Here are some different types of benches to consider having installed in your shower. A ledge-style bench runs entirely across one of the sides or ends of the shower stall and can often be built into the wall and tiled over. In this sense, the bench matches perfectly with the walls above and beside it. Some homeowners favor this type of bench because it's fully enclosed, which means that you don't need to clean under it. Conversely, some people may feel that the bulky nature of this design gives the illusion that the shower stall is a little smaller than it may actually be. 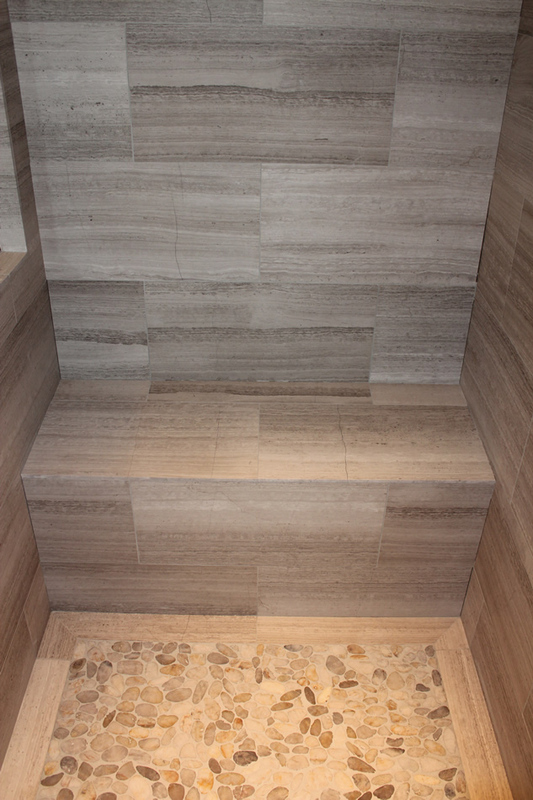 A wooden bench is another useful bench style to consider for your stand-up shower. Your remodeling contractor can simply place a removable bench in the shower, or actually build a bench into the enclosure, perhaps spanning from one wall to the other. Wooden benches can be visually appealing, especially if you have other wooden elements in the bathroom and the two types of wood match or complement each other. Wooden benches give a light, open feel, but their potential downside is that due to the exposure to water, you'll have to refinish them periodically. A corner bench is a small type of bench that sits in the corner of the shower stall. It may have a base and be fully enclosed, or it may be open below. This type of bench is handy in smaller showers in which a full-sized bench may take up too much space. If you're leaning toward a corner bench, you'll need to make sure that you have a showerhead that can be easily moved in case you want the water to hit you while you're seated. Corner benches can be made from a variety of materials, including tile, natural-looking stone, and wood.